Posted December 2, 2018 by Diane & filed under Miscellaneous, My Books. I love to give books for holiday gifts. This year, some of the books I give will be reaching recipients in book boxes, so a book with a few other little things that go with the theme. 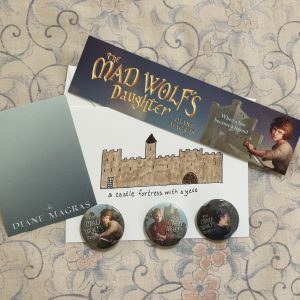 As I was thinking of what would go with each book, it occurred to me that I have some lovely wee pieces that could go with any copy of The Mad Wolf’s Daughter that someone else might like to give: the character buttons of Drest, Emerick, and Tig that are so popular at my in-person events; a personalized bookplate to sign the book for the intended recipient, as well as themed bookmark; and a personal note. I’ve done a few of those in giveaways, and it’s been fun to write as an author to a student who loves to write, or a student who needed a book friend. And I figured I’d offer that as well in my own hand-sketched castle cards (every one of them is different). Comment here or DM me on Twitter if you’re giving the gift of Drest to a student this holiday season, and I’ll send you the book box parts pictured above. I’ll send these out until the end of December, or as long as my supplies last. Happy Holidays!